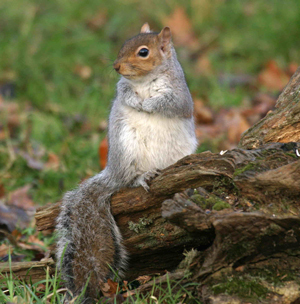 With the exception of the introduced Grey Squirrel and the domestic Cat, most of the mammals visiting our gardens are rather less obvious than visiting birds. Some, such as Hedgehog, Badger and Red Fox, may be nocturnal visitors, while others, such as Wood Mouse, Bank Vole and Common Shrew, are easily overlooked. Most garden-visiting mammals are less mobile than their bird counterparts, something which restricts their penetration into urbanized landscapes and it is likely that the range of mammal species visiting will be strongly influenced by the nature of the surrounding habitat.